The Lab10 MBE System is the standard MBE system with a loadlock chamber and with an optional preparation/storage chamber. The substrate size for the Lab10 MBE system is the Scienta Omicron standard sample plate. Its proven chamber design with up to 7 effusion cells is revealed in an excellent thickness homogeneity for a 10 mm substrate. The effusion cell capacity can range from 10 cm3 up to 35 cm3 for layer growth. The fast & reliable sample transfer together with the excellent performance results in a low cost of ownership. The optional available easy & intuitive to operate growth control software and the possibility to add standard Scienta Omicron analysis equipment makes this a unique MBE system for researchers. 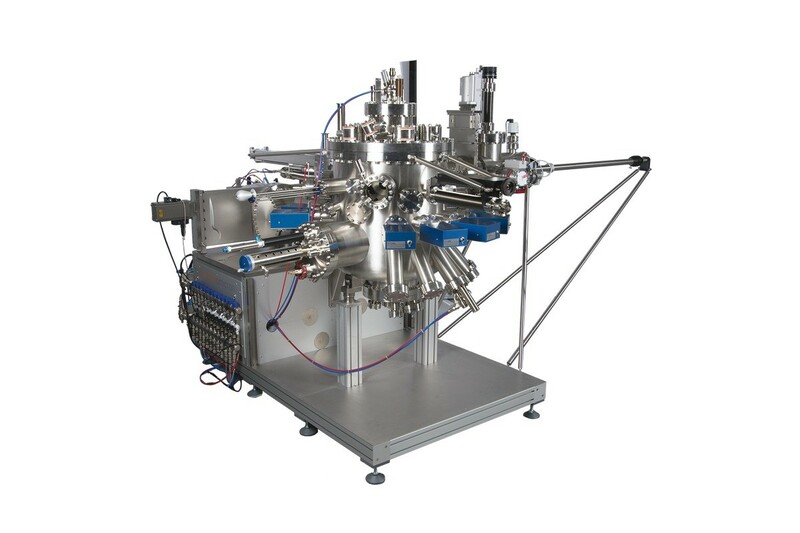 A sample preparation and storage chamber with its own pumping system is also available. Due to the modular design of the Lab10 MBE-System this chamber can be retro-fitted also at a later stage. The distance between the source flanges on the cluster flange and the support frame bottom is optimized for very good accessibility to all effusion cells. All shutter blades are operated from soft-acting shutter modules. The increasing/decreasing shutter movement speed follows a sinusoidal speed curve to avoid particles being flinged away by the shutter blades. Special care has been taken to allow safe operation using interlocks and convenient system control. The bakeout tent ensures homogeneous heat distribution for ultimate vacuum conditions and cleanest environment. The system comes completely assembled and fully tested as a turn-key system. The Lab10 MBE-Systems can be easily extended with Scienta Omicrons MULTIPROBE analysis systems providing various analysis techniques such as SPM, AFM, XPS, UPS, AES, SEM and many others without compromising the performance. The standard pumping configuration for the deposition chamber consistis of an Ion Getter Pump, a Titanium Sublimation Pump and a Turbomolecular Pump with oil-free Roughing Pump. Higher pumping speeds are available on request, like a larger Ion Getter Pump or a larger Turbomolecular Pump. The standard pumping configuration for the preparation / storage chamber consists of an Ion Getter Pump or a Turbomolecular Pump and a Titanium Sublimation Pump. The standard pumping configuration for the loadlock chamber consists of a by-pass pumping to the main Turbomolecular Pump. An option is a dedicated Turbomolecular Pump with oil-free Roughing Pump for the loadlock chamber. The pressure measurement for the deposition chamber and for the preparation / storage chamber makes use of an Ion- and Pirani-Gauge while for the loadlock chamber an optional combined Pirani-/Cold Cathode-Gauge is used. The sample manipulator accepts standard Scienta Omicron small samples and is compatible with all our analysis equipment. Note: Specifications and descriptions contained in this website are subject to alteration without notice. For guaranteed specifications please inquire official documentation. 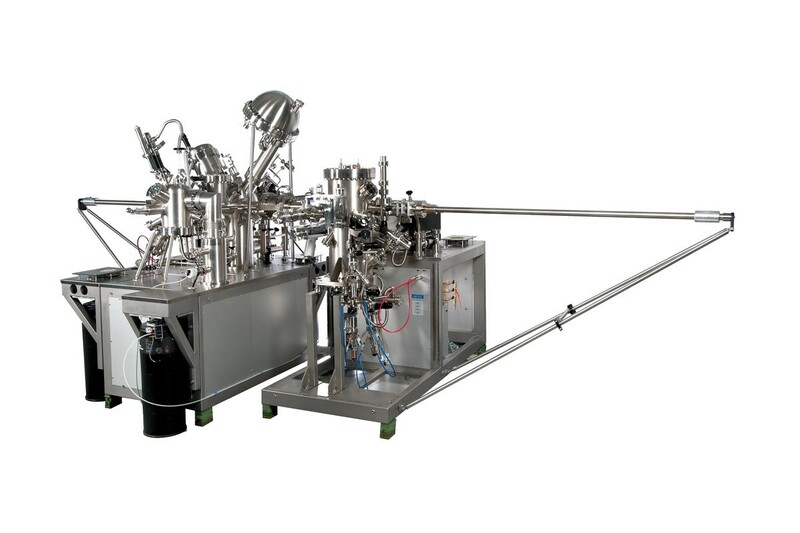 A sample preparation and storage chamber with its own pumping system is also available. Due to the modular design of the EVO MBE-System this chamber can be retro-fitted also at a later stage. The distance between the source flanges on the cluster flange and the support frame bottom is optimized for very good accessibility to all effusion cells. All shutter blades are operated from soft-acting shutter modules. The increasing / decreasing shutter movement speed follows a sinusoidal speed curve to avoid particles being flinged away by the shutter blades. The customer can choose for special effusion cells with user adjustable tradeoff between thickness uniformity and material consumption by using the crucible insert technology. In addition all sources are usually mounted into water cooling shrouds and therefore reduce the LN2 consumption significantly. Special care has been taken to allow safe operation using interlocks and convenient system control. The bakeout tent ensures homogeneous heat distribution for ultimate vacuum conditions and cleanest environment. The EVO MBE-Systems can be easily extended with Omicrons Multiprobe analysis systems providing various analysis techniques such as SPM, AFM, XPS, UPS, AES, SEM and many others without compromising the performance. 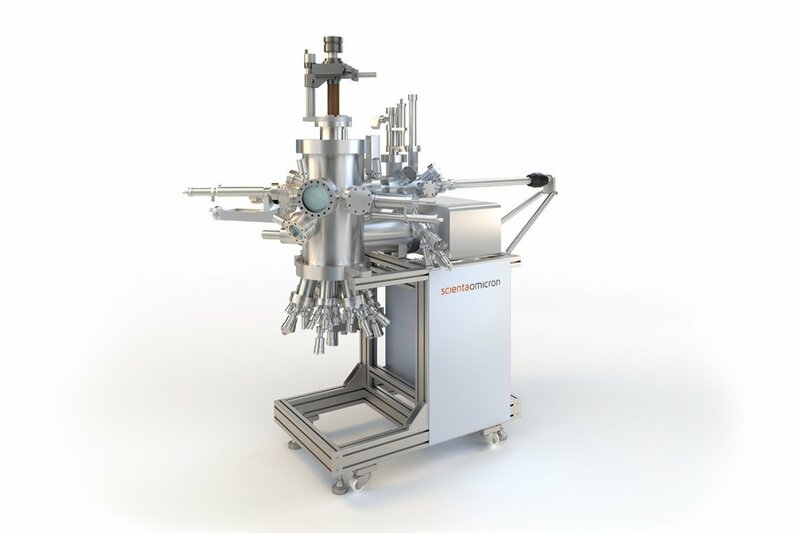 The standard pumping configuration for the deposition chamber consistis of an Ion Getter Pump, a Titanium Sublimation Pump and a Turbomolecular Pump with oil-free Roughing Pump. Depending on the application, a cryopumping system can be added for highest pumping speed and ultimate base pressure during the growth process. Higher pumping speeds are available on request, like a larger Turbomolecular Pump. The sample manipulator for the EVO MBE-Systems accepts substrates with 1“ or 2” in diameter and smaller Omicron standard sample plates (using a suitable adaptor) and is compatible with all Omicron analysis equipment. The PRO-75/100 MBE-Systems are dedicated growth systems with a loadlock chamber and with an optional preparation/storage chamber. The substrate sizes are either 3” (PRO-75) or 4” (PRO-100). The systems of course also accept smaller samples (1” and 2”) and the Omicron standard sample plates. The carefully designed chamber with up to 12 effusion cells shows excellent thickness uniformity for all substrate sizes. The large effusion cell capacity of to 130 cm3 for layer growth increases the up-time of the system significantly. The distance between the source flanges on the cluster flange and the support frame bottom is optimized for very good accessibility to all effusion cells. All shutter blades are operated from soft-acting shutter modules. The increasing/decreasing shutter movement speed follows a sinusoidal speed curve to avoid particles being flinged away by the shutter blades. The customer can choose for special effusion cells with user adjustable tradeoff between thickness uniformity and material consumption by using the crucible insert technology. In addition all sources are usually mounted into water cooling shrouds and therefore reduce the LN2 consumption significantly. Special care has been taken to allow safe operation using interlocks and convenient system control. The bakeout tent ensures homogeneous heat distribution for ultimate vacuum conditions and cleanest environment. The standard pumping configuration for the deposition chamber consistis of an Ion Getter Pump, a Titanium Sublimation Pump and a Turbomolecular Pump with oil-free Roughing Pump. Depending on the application, a cryopumping system can be added for highest pumping speed and ultimate base pressure during the growth process. Higher pumping speeds are available on request, like a larger Turbomolecular Pump or larger Ion Getter Pump. The sample manipulator for the PRO MBE-Systems accepts substrates with 1“ to 4” in diameter and smaller Omicron standard sample plates (using a suitable adaptor) and is compatible with all Omicron analysis equipment. Virtually unlimited thin film growth techniques. The customized LAB-10 Laser-MBE System is equipped with a preparation chamber for sample pre-treatment (e.g. sputtering or heating) and a loadlock for fast sample introduction. Two target stages for ablation of materials with a laser have been added as additional functionality. Standard Omicron samples can be used for both the MBE deposition process as well as the PLD process or even simultaneously and at high temperatures. 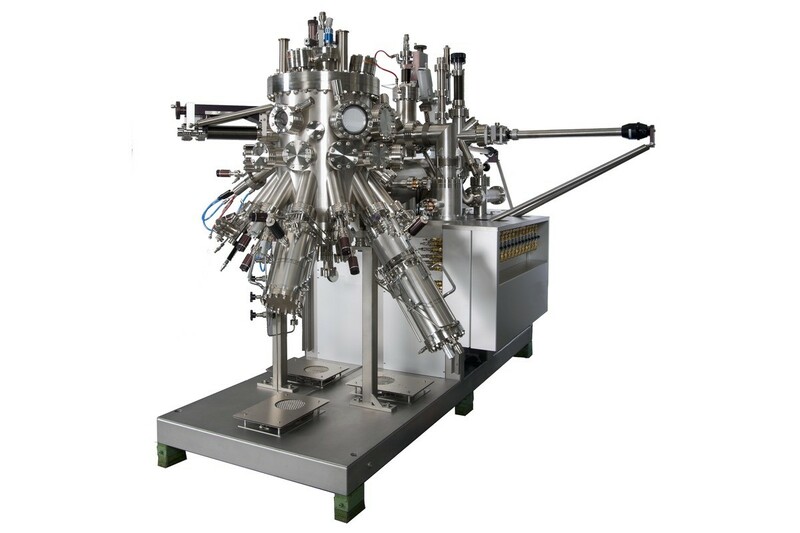 In addition to the two PLD targets, up to seven deposition sources can be attached to the growth chamber, including for example an Arsenic cracker source, effusion cells or organic material sources. In-situ growth control is realized using a differentially pumped High-Pressure RHEED system. A new MBE system which allows experiments related to graphene heterostructures or nanoscale ferromagnets. Graphene hydrogenation after contacts are formed with a stencil mask in the main deposition chamber and the main deposition chamber itself. This chamber is equipped with a sample heater and a hydrogen source. Furthermore a second satellite chamber is being configured to allow in-situ-magneto-transport measurements. For more details please see Pico 2011. State-of-the-Art PRO-75 III-N MBE system for 3" sized substrates with an additional in situ VT SPM directly attached. It is equipped with various effusion cells and doping sources for III-V materials growth, RHEED, beam flux monitor and EPI-Soft software. For additional information please see Pico 2010. The analysis system for Catalysis Research is equipped with various surface analysis and sample preparation techniques Integrated surface spectroscopy methods are: XPS and PAX (photoemission from adsorbed Xenon) @ 50 K, UPS and LEED for quantitative chemical and structural analysis of solid surfaces and probe of local electronic structure. Raman spectroscopy is used to identify surface species and their bonding @ up to 1 bar (atmosphere) pressure. The system is also equipped with an Electron Paramagnetic Resonance spectroscopy (EPR) @ up to 1 bar and a cyclic voltametry (CV) and electrochemistry in aqueous conditions.